You have a pair of very cool jeans that you love and fit well but suddenly they are disintegrating into an annoying mess of holes. 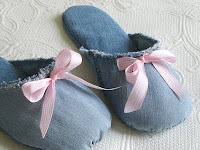 You want to maintain the fashionably distressed look but they desperately need mending. 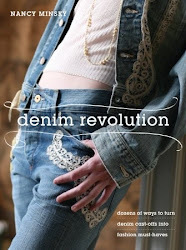 Mend them by integrating your stitches and handwork with the worn denim texture. 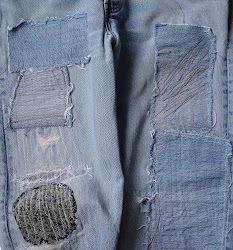 To make them durable and chic you will fuse and patch on the inside and then re-enforce with stitching in the worn areas. If you have some general sewing experience you can easily mend your jeans with this technique. note: Search through your scrap bin for a cotton fabric that reflects the style of the wearer and the jeans. The plaid fabric used in this example is a good unisex option. note: choose a shade that blends with the worn area you will be mending. A single pair of jeans has many different shades. Well matched thread is an important style element. General sewing materials including: scissors, straight pins, hand sewing needle, sewing machine with a “denim sewing needle”, iron, ironing board, ruler or tape measure, seam ripper. 1. With your seam ripper open the side seam from a couple inches below the pocket to a couple inches above the cuff. 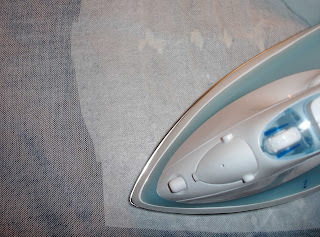 note: In this way you will be able to easily maneuver around to stitch the patches. 2. Measure the area you want to patch, and cut the fusing to size accordingly. Note: The patched area in the example in the photos is the width of the front leg, from the side seam to the crotch seam. When jeans are quite worn like these it’s more efficient to patch the entire area, to avoid having to frequently make additional patches. 4. Turn your jeans inside out and press well the area you will patch, also smoothing and pressing neatly in place any loose denim threads. note: the plaid patch will protect the fusing from rubbing loose from the jeans and also be feel more comfortable (a lovable denim characteristic…) than the fusing. 7. Turn your jeans right side out. As in the above photo, any loose denim threads have been glued neatly to the fusing. 8. Thread your sewing machine with the denim thread and set at a medium stitch length. Using the basting stitch as a guide, stitch all around the perimeter of the patch. 9. Machine stitch back and forth over every split, hole, exposed white denim threads and terribly worn areas. Sew more or less in parallel rows, and if it is an area that will get quite heavy wear, then re-enforce with zigzag or darning stitches. Sew until you are satisfied with the look and the durability. Your repairs will look like the photo below, quite invisible and blending with the naturally worn shade and coloration of the denim. 10. Pin the side seams together, baste and sew along the original stitching line. 11. Pull all the thread ends to the back and knot well. Remove any basting. Press. 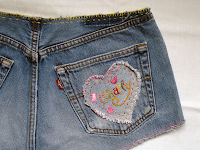 You are finished, and it looks brilliant, perfectly distressed, super cool, and ready for a lot more wear!